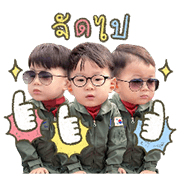 http://www.line-stickers.com/ – The Return of Superman: Triplets Special Line Sticker | The little triplets are back! Meet Mingook the fun-loving sweet pie, Manse the free soul who loves to hang out, and Daehan the warm-hearted big brother. Previous post Meet Harry, SGAG’s Pet Otter!